The Actionable SaaS Metrics series goes beyond measuring and calculating. It takes a deeper look at some characteristics of common subscription metrics, with the goal of identifying key actionable steps to optimize them for your business. Customer Churn. Everyone loves talking about how to calculate it, how to reduce it, and how bad it is (us included!). But isn’t it time to sit down and figure out how we can actually influence it, and what actions we can actually take, given certain characteristics? Well, you’re sitting in a pretty good position that a lot of businesses would be envious of – well done you. But just before you pop the champagne and log off for the day, we should be sure that the numbers you’re looking at actually make sense. It’s important to make sure you’re only measuring paying customers in this formula – free trial customers should be excluded, as well as those on a free plan (if you use a freemium model). What counts as ‘low’ Customer Churn Rate? Many SaaS companies at a growth stage report monthly churn rate of around 2-5%. Remember that this level of monthly churn rate still equates to losing a significant amount of your customer base in the longer term – A cohort of customers acquired in a single month would half in size over the period of a year! The other thing to remember is that we’re talking about customer churn rate – not MRR churn rate. It’s okay to lose customers, if they’re not the customers contributing a large proportion of your MRR. Consequently, a high MRR Churn Rate can be much more destructive to the growth of a SaaS business. Continue to invest in customer success and lowering churn – what you see may just be a temporary characteristic of your business at this point – i.e. maybe nobody has reached the “critical” churn risk period yet. Pat yourself on the back. You’re doing okay so far! Because churn compounds (just like recurring revenue), a 5% churn rate over time can severely limit the growth of a business. What is ‘high’ Customer Churn Rate? Anything over 3-5% should be sending warning signals. Although some businesses by design are more tolerant of higher churn levels – i.e. B2C businesses with a large number of customers paying a tiny amount will always exhibit a higher customer churn rate. For this reason, it’s often better to look at MRR Churn Rate (which will account for this). 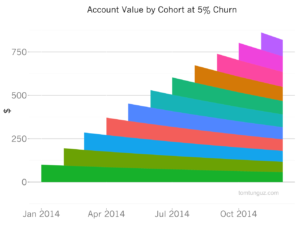 First, segment your churn into Cohorts – look at a Cohort Analysis. You can use a platform such as ChartMogul for this. Identify any specific months of high churn in the customer lifetime. Find out why customers are churning, particularly in those high-churn months you just identified. Talk to them! Or perhaps implement an exit survey when people cancel. Implement a framework for customer success in your business, aimed at helping customers achieve their goals within your product. This might seem like a strange one, but it’s entirely plausible that your calculated Customer Churn Rate would jump around from one month to the next – it’s actually quite a common symptom, particularly in smaller SaaS startups with just a few customers. It may seem obvious, but if you have just a handful of customers and you lose one of them, that’s a BIG percentage churn for you. Conversely, a large enterprise with thousands of customers requires a much larger number of cancellations to have an impact on the overall churn rate. Make sure that you’re calculating Customer Churn Rate correctly and consistently. Check The Ultimate Churn Cheat Sheet for more detailed examples. If your number of customers is fairly small (less than 100 customers), consider removing focus from the Customer Churn Rate metric at this point – an unstable number will not help you make consistent, positive decisions about your business. Instead, why not focus on talking to your customer base to understand their experience and needs from your product?